POWERHOME Solar customer Jill Barnes is like so many others, in that she and high school sweetheart-turned-husband-of-35-years Tim look for ways to save money and improve their lives in the process. But her story is unfortunately unlike many others, too. On her way to sign up to become a volunteer emergency medical technician in a neighboring community in 2012, Jill broke her neck in two places after an 89-year-old man ran a stop sign and struck her car. The result left her unable to work and in need of extensive physical therapy. Those needs meant having therapy even after her health insurance stopped covering it. And because she had previously stopped working to care for her father for 17 years, she had no social security disability insurance to cover such expenses, either. Barnes installed an indoor swim spa at her Lima, Ohio, home that allows her to do the exercising she needs to even move following two surgeries and the multiple plates and screws stabilizing her neck. She’s in the spa three days a week and 45 minutes at a time. Better that than taking painkillers and risking potential addiction to other drugs, something she saw far too often in her prior line of work. Because the swim spa must be continuously heated, it more than doubled her family’s cost for power. With that bill getting out of hand, Barnes saw one of POWERHOME’s Facebook ads and contacted the company to see if solar panels could help. Barnes’ home went from using 1,400-2,000 kilowatt hours a month to being the most energy efficient home in the area. 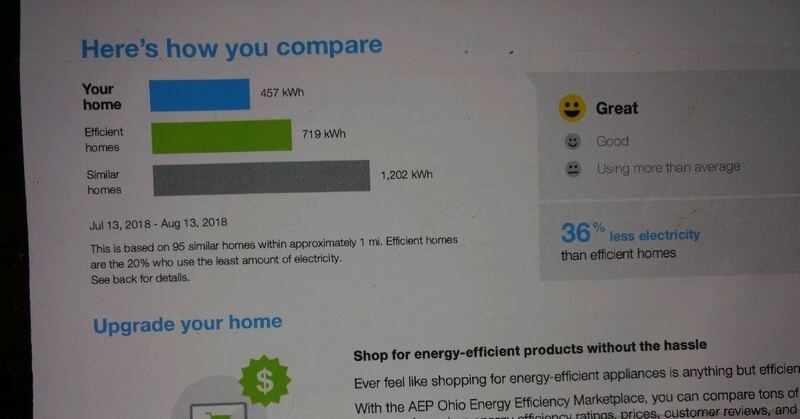 She shared with POWERHOME a picture of her energy usage, which you can see above. In using 36 percent less electricity than even the most energy-efficient homes in her area, she proudly calls her home “solarficient.” Her system was installed in July. But Barnes’ road to get the panels came with a potential roadblock. To get the most energy production from the proposed 15-panel roof array, POWERHOME needed the panels to go on the front of her home, but her township ruled that they go on the back. A variance hearing was set to get the permission to install on the front, and POWERHOME covered the Barnes’ cost for it. After POWERHOME sales consultant Colleen Dempsey educated township officials on how the system would look and work, the variance was granted, allowing Barnes’ solar project to move forward. “Once she showed the pictures and we explained everything, I think there was a couple of them that were real interested in getting solar too,” Barnes said. In the time since her system has been installed, Barnes has been a huge proponent of POWERHOME Solar on the company’s Facebook ads, sharing her successes and answering questions about the process. In all, she’s posted 74 comments. Barnes has said that she plans to have her system paid off in five years, which means the power that her system generates will be completely free to her after that fact. Without the ability to work because of her injury, she and her husband plan to put the savings from their electric bill toward retirement or other investments. The Barnes’ solar system has generated buzz in their neighborhood, and the couple that Jill and Tim routinely play cards with even has plans to call POWERHOME next spring, after hearing about the couple’s success. Saving money and improving lives. Jill and Tim Barnes’ home is powered by the solar energy that gives them the chance to do both.